The Constitution defined a container, but not the content. Nothing in it says that the Senate has to be a partisan body. It has become so by choice, due to a particular political culture. Filling the Senate with non-partisan members is a practical first step to its cultural evolution. Alain Miville de Chêne Entrepreneur, investor, student and lover of life. Overlooking the seat of the Canadian Senate, Parliament Hill, Ottawa Canada. The room is often called the Red Chamber. 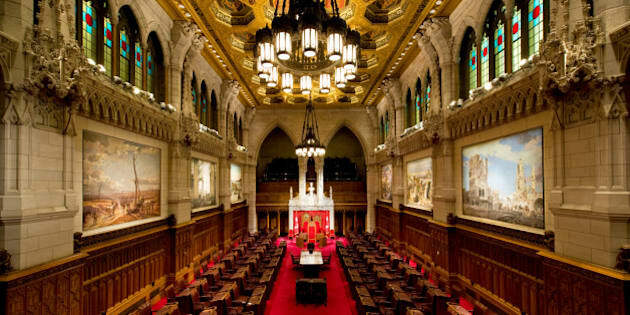 Prime Minister Justin Trudeau will formalize the process of choosing potential senators by setting up an Independent Advisory Board on Senate Appointments (IABSA) which will follow public, merit-based criteria to identify potential senators. The central guiding principle is summed up in the words "non-partisan." We are at a rare juncture in Canadian politics where an idealistic prime minister is trying to do the right thing, contrary to the received wisdom of most other politicians. Let's hope it lasts. Non-partisanship starts early -- in the initial choice of the appointees to the IABSA who should be eminent Canadians having no known party affiliations. We have two large pools of such people: the recipients of the Order of Canada, and those who have been awarded honoris causa diplomas from Canadian universities. I am sure readers can suggest others in a similar vein. There must be, among them, a few who have never been in politics and who would volunteer to be members of the IABSA. By restricting our choice to these people, we have some assurance that backstage shenanigans will be minimized. Since there is no such thing as a non-partisan provincial government, none should have any say in the choice of appointees. There will certainly be more candidates than there are positions available. To provide the ultimate legitimacy, the final choice of appointees should be a random draw among the candidates. The drawing of lots to fill a post is an ancient technique which completely severs the possible links between groups of influence and the chosen person. The candidate would owe nothing to anyone, and no one could have influenced the choice. Someone who wishes to serve on the IABSA should have no reservations about the public knowing and commenting about the process. Transparency is one of the best guarantees of integrity. If one is not selected, it is because of the random draw, not because they were rejected. The possible humiliation of rejection is an often used pseudo-argument for having candidacies kept secret. This is not a conventional job interview, it is an occasion to serve the country. Everything should be in the open. Inevitably, there could be some residual bias present in the initial establishment of the list of candidates prior to the random draw, but we need to start somewhere. Later on, as members of the IABSA need to be replaced, the board itself could do that work. In a subsequent article, I will show that electing the senate or abolishing it are both simplistic approaches to bettering our parliamentary system. We know, from the 2014 Supreme Court of Canada reference on Senate reform, that these changes are not in the cards for now, but our existing institutions are much more flexible than we think. The Constitution defined a container, but not the content. Nothing in it says that the Senate has to be a partisan body. It has become so by choice, due to a particular political culture. Filling the Senate with non-partisan members is a practical first step to its cultural evolution. One of the great things about the Senate is that no one in the government or in the House of Commons can tell it what to do -- they must figure it out for themselves. Even though all companies are governed the same laws, the way they treat employees ranges from tyrannical exploitation to open democratic participation. Similarly, the Senate under one constitution can evolve its culture from rigid partisanship into that of a non-partisan group of legislators dedicated to the long-term welfare of Canada. They are the ones tasked with exploring ideas and policies using a factual and objective mode of thought complementary to the limited ideological stances necessary for partisan politics. For now, we can't change the structure of the Senate, but we can change its composition and hope that the senators will evolve their culture to more closely match its lofty possibilities. They will then fully deserve the title "honourable," which means behaving in an honest, fair, or responsible way.